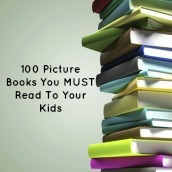 Home » Books » 100 Pictures Books You MUST Read to Your Kids!! 100 Pictures Books You MUST Read to Your Kids!! As a mother of four, and a former classroom teacher, I’ve had the absolute privilege of reading hundreds and hundreds of children’s books. For me, there is nothing as magical as sharing a story with your child, and watching the world unfold before them. Books spark imagination, inspire creativity, and set children on the path of life-long learning. With the popularity (THANK YOU) of my list of 100 Chapter Books You MUST Read to Your Children!, I wanted to create a similar list using picture books. My hope is that you will be inspired to head to your local library or bookseller, and begin working your way through this list with your children/grandchildren. 90. Chicka, Chicka, Boom Boom by Bill Martin Jr.
LOVE this list too! One of our favorites is “Little Blue Truck” by Jill McElmurry. Not only is it a great story but the illustrations are fantastic too. Thanks Martha! I had that on there, and took it off…It is a favorite of my son Harry. We have the sequel for that book as well. I actually have a post in the works of my faves for younger kids, and it will definitely make that list! This looks to be an older post, but I’d add “Goodnight, Goodnight Construction Site” by Rinker and “I Stink” by McMullin both are great picture books, especially for little boys. I agree! Goodnight, Goodnight Construction Site is #75, and we love it! I do like I Stink and I’m Mighty as well….perhaps on list #2! Thanks for stopping by! I love your list and I believe in picture books! I would add at least one book by Patricia Polacco, Mrs Katz and Tush is my favorite. I actually can’t believe I left her off of my list! When I was teaching, she came to visit our school! Perhaps I’ll create a Part 2 list someday! Ooops…well, we love all the sequels too, I guess I was looking for all of those. It’s actually #25. =) One of our favorites. What a wonderful list! Thank you! I’ll have to head to the library now! Lol. My kids and I are completely in love with Julia Donaldson’s books: Room on the Broom, The Gruffalo, Stick Man, Highway Rat, and so many more that she wrote.